I believe in a natural flow of the universe. Energy, time, souls, nature, god, vibes, spirituality and all of those labels are all wrapped up into this natural flow of things. I like to think that anytime folks are praying, meditating, getting spiritual, or whatever they do, they are attempting to connect to the same thing I speak of. It is all around. I try to live in harmony with the flow as if I was riding a river of time through this crazy human existence. Never swimming up river. I want to catch the current, and ride it all the way. Part of living this way requires honing the skills to read the flow to catch it and roll with it. Often it is a feeling, a premonition, deja vu, a sign, or again, any of the labels we choose to put on it. The key is to feel it, believe it to be real, listen to what it is telling you, and act on the discovery. Call it what you want, but harness it's powerful direction and your life will flow out in front of you like a mighty river offering adventure, challenge, and your whole life around every bend. My wife, Christine, and I had set aside some time for another mountain bike adventure. We had decided to go back to Fruita, which we had explored two weeks ago. I was at work at Delta just two nights before we were to leave. I was in the bin of a Canadair RJ 700 when I got a sudden feeling that my old friend, Rob Brenneman, might be going to Moab that weekend. He had reached out to me months ago to see if I wanted to do a fall trip to Moab sometime. He had no dates or plans at that point. I gave my standard,"Don't plan around me, but keep me in the loop. I am so busy, but you never know." I never heard back from him. Flash forward back to the luggage bin. I heard the whisper of the universe, and whipped out my phone to send him a text, "When you headed to Moab?" ^His immediate response, "This weekend. You wanna go?" I laughed to myself, called my wife, and we quickly and easily made Moab our destination. Fruita and Moab are actually pretty close to each other so it seemed to work out just right. It was almost as if it was predestined to work out that way. Huh? The universe spoke to me, I listened, and now we were stoked driving south under a full moon rising over a brilliant aspen grove. A sweet solo trip turned into an adventure with old and new friends that we never even saw coming. The best kind. ^We arrived at the remote campsite location that Rob had scouted just north of Moab. We rolled in late, but my old friends Rob and Greg Barry were waiting up with their buddy, Mark. Soon after, the rest of the group arrived as Greg's girlfriend, Lonnie, and another friend, Matt, pulled in. We all gathered around a fire, shared a beer, and quickly retreated to our tents to rest for a big day to come. ^Morning in the Utah desert. ^Campsite coffee and laughs with old and new friends. ^No time to waste though, and we were on our shuttle up to the La Sal Range. We were on a mission to ride the 30 plus mile, "Whole Enchilada" trail. This ride links up a bunch of the Moab classics in an epic top to bottom experience. 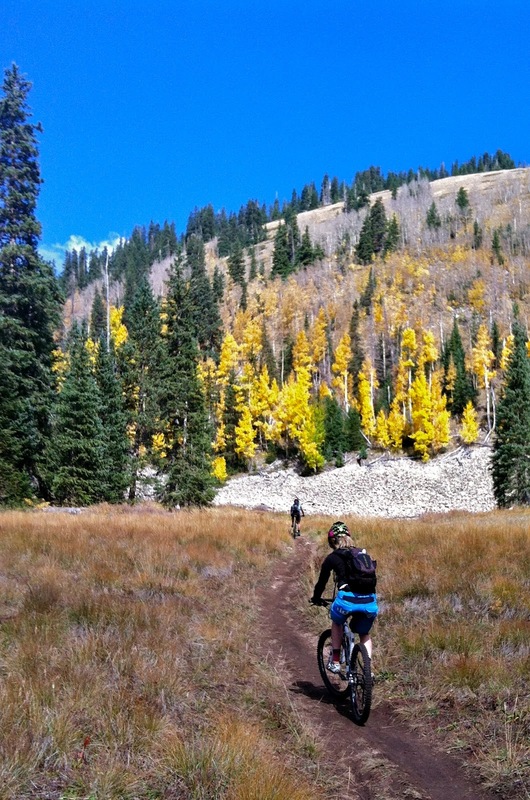 From the tree line of the La Sal Mountains to the river bottom of the Colorado River, this trail has it all. Hence the clever name. Christine and I were definitely upping our game to make this huge ride with the crew of rippers we were undertaking it with. Thankfully they are all radically good sports, and they appeased our speed and skills all the way. ^Some of the crew approaching the big, but relatively short climb that begins the ride. The high terrain was in full fall color. I wasn't expecting so much beautiful fall color in the Utah desert, but I had also never been in the La Sal high country in the fall either. It was a pleasant surprise. ^The crew stopping to have our minds blown by the aspens. ^Greg is jumping out front. Let's roll. ^After descending through the magical kingdom of aspen groves and pine forests we were able to stop and look back at all of it from this point. So beautiful, and so vast. Oh yeah, and we just rode all of that, and still have about 20 more miles and myriads of natural environments left to go. Breathtaking, literally, and figuratively. ^Another different environment. Another vastly scenic view. Another 15 miles to go. ^A quick break in yet another different environment. From pines and aspens, to a sage brushed desert rim, to slick rock hoodoos. This just keeps getting better, and still 10 miles to go. ^ By this time the legs are dying, and Christine and I are digging deep into ourselves to find the motivation to finish strong. 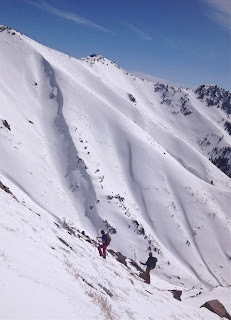 At one point I uttered to her, "The only way down off this mountain is down." Simple statement, but it has literal and metaphorical meaning when your in that state of mind. We had nothing left in the tank, but miles to go. In those moments you must find a place inside of yourself that allows you to persevere beyond the limits that once existed. You breakthrough to a place you didn't know you had. At one point all I could do was laugh because as I followed Christine through the technical terrain I had come to a realization. Christine had broken through to a place where she was charging over rocky ramps and ledges of slick rock that she never would have thought she could handle. She was in the zen focus of the adventure at hand, and was totally ripping like she had never before. Her limits were melting away with each turn and ledge drop. One killer moment happened as I was chasing her tail through the slick rock single track. I heard her abruptly holler with excitement. However, just as I heard it I realized that she had just crushed a double rock drop, and now I was soon to be airborne off the first ledge myself. As I landed unexpectedly, I careened towards the second larger drop with no way out but to roll with the line. Landing again, I to let out a holler of stoke just like she had. We had just both just stuck a line way over our heads, and then continued pedaling away in hysterics. We were having some fun. ^We descended to the mighty Colorado River with rubber bodies and delirious minds. The whole group was rolling down the busy river highway exit of our ride with motor vehicles buzzing by when the full moon popped up from behind the night skyline ridge. 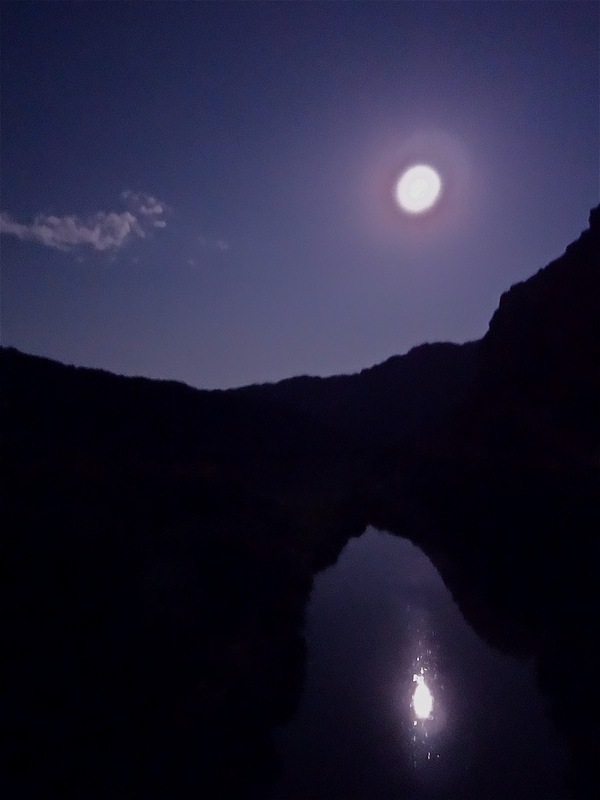 I deliriously laughed at my situation at the front of a line of mountain bikers descending though an amazing river canyon lined with giant cliff walls glowing in full moonlight. I was overcome by the moment and let out the call of a wild wolf's howl. One by one the rest of the weary souls behind me opened up in their own howls at the moon. In the echo of the wild outpouring I was giving thanks to the power that had brought this all together. You can try to plan moments like these, but they are so fleeting and magic that when they happen all on their own it is among the greatest gifts that life can deliver. So much beauty. ^On a bridge over the river we got a stranger to snap a photo of us as we enjoyed some dry clothes, a cold beer, and our sense of accomplishment. We had come a long way, and pushed our limits and spirits to new heights. It was a great ride with great folks. ^Back at the camp after dinner we laughed and reminisced on our day. Good friends, cold beers, and cold temperatures all settled in as we sat around the warm campfire with warm feelings. The world was right with each and every one of us under the full moon lit sky. From the whisper of a premonition in the luggage bin of an airplane in Salt Lake City, to a top of the world trailhead in the La Sals Mountains, to river bottom howling under a full moon, to our warm campsite of weary souls in the Moab desert, the universe had lined it all up and laid it out in front of us to grab onto and ride with reckless abandon. Roll on! Ready or not... here comes snow!